Home Contact Products Mobile Home HVAC Products Finance Learn More! The Affinity is one of the quietest series ever offered by York. High-efficiency compressors are the quietest type of compressor available. Quieter compressors are isolated behind an advanced composite material further reducing transmitted compressor noise. Advanced fan design for smoother air flow and reduced noise. The QuietDrive™ System features a swept-wing fan design, isolated compressor compartment, composite base pan, and high-efficiency compressor technology that provides quieter operation than conventional systems. 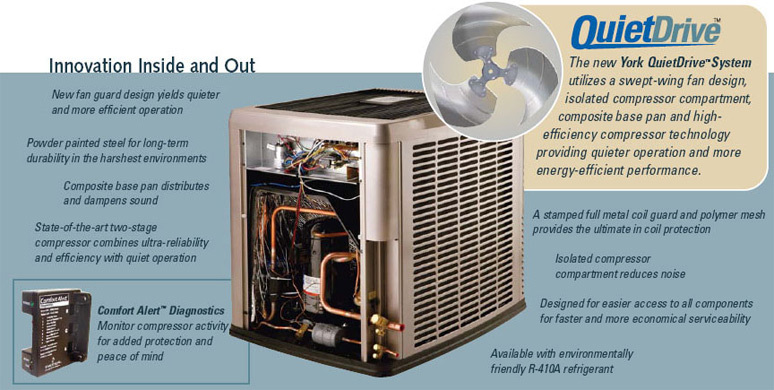 Two-stage compressor technology that provides up to 4x quieter operation and 60% more energy efficient operation. A composite base pan distributes and dampens sound. The Affinity is so quiet, you may never notice it running. * For every 3 decibels quieter, sound power is cut 50%!